An inspirational friend, Melanie Ward, spoke at our Sunday evening service about her 3 months in Hebron as a human rights observer with the Ecumenical Accompaniment Programme in Palestine and Israel. We are so accustomed to hearing about the conflict in “the Holy land” that it is easy to gloss over news reports and to give in to a feeling of powerlessness. Melanie’s first-hand account of life in Hebron, quite literally walking along-side the Palestinians as they tried to get on with daily life, really brought home to me the reality for the Palestinians and the need to do something, anything, to make things better for them. A significant barrier to even the possibility of exploring peaceful solutions between the 2 states is the establishment of Israeli settlements on Palestinian land. This is illegal under international law, but not only are the number and size of settlements increasing, the Israeli government and police provide funding and military support to protect the settlers, to the severe detriment of the Palestinians, and more generally to any potential peace. You might be wondering why I am covering this conflict in a blog concerned with “conscious consuming”! It is in fact highly relevant. The trade with the settlements bolsters their economies, contributes to the settlements’ permanence and therefore undermines efforts to achieve peace and security for both Israelis and Palestinians. 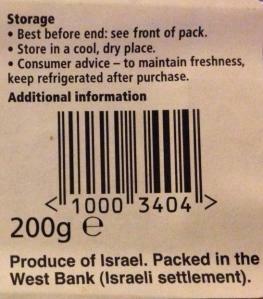 Until recently it was difficult to know whether your supermarket purchases were supporting these illegal settlements as products were generically labelled “Israel”, which might have included goods produced in the occupied Palestinian territories (OPT). However product labelling has now become much clearer thanks to new EU guidance. Many and varied organisations are supporting a boycott of goods from the OPT – Methodists, Quakers, ECCR and many British Jews (see JFJFP and Jews4BIG). Check out the activist research web-site Who Profits?, which is dedicated to exposing the commercial involvement of Israeli and international companies in the continued Israeli control over Palestinian and Syrian land. Archbishop Desmond Tutu has recently written an article in an Israeli publication supporting boycotts, sanctions and divestment – his plea to the people of Israel: Liberate yourselves by liberating Palestine. Do you know whether products you buy come from the OPT? Next time you go to the supermarket to buy fresh fruit and vegetables, especially dates, herbs, peppers, tomatoes, stone fruit, figs and potatoes, make sure that it is not labelled ‘West Bank (Israeli settlement)’. Prioritise goods that are labelled ‘West Bank (Palestinian)’ as they have definitely come from Palestinian farms in the West Bank. Refer to the Quaker guide Trade-with-Israeli-settlements for more detailed information. Ethical Consumer has a whole section dedicated to Israel boycotts. Current brands boycotted include: Mejoul dates, Lloyds TSB, Caterpillar, Volvo, Daewoo, Soda Stream, Starbucks, Coca-cola, McDonalds and Nestle. – Join the Avaaz campaign asking the CEOs of ABP, HP, Veolia, Barclays, Caterpillar and G4S to stop their continued investment in companies and projects that finance illegal settlements and the oppressive occupation of the Palestinian people. – Follow ECCR’s guidance about writing to your supermarket to challenge their policies. – Email your MP and ask them to write to the Foreign Secretary. – For further information about opportunities for BDS read War on Want’s publication – Boycott, Divesment, Sanctions – Justice for Palestine. – Respond to the call from Palestinian Christians with Kairos Britian – join or start a Kairos Community, take political action, challenge the misuse of the Bible, pray, and go and see the situation for yourself.